So I have wasted (invested) a day or two just to find out how to publish a JAR using Gradle to a locally running Artifactory server. 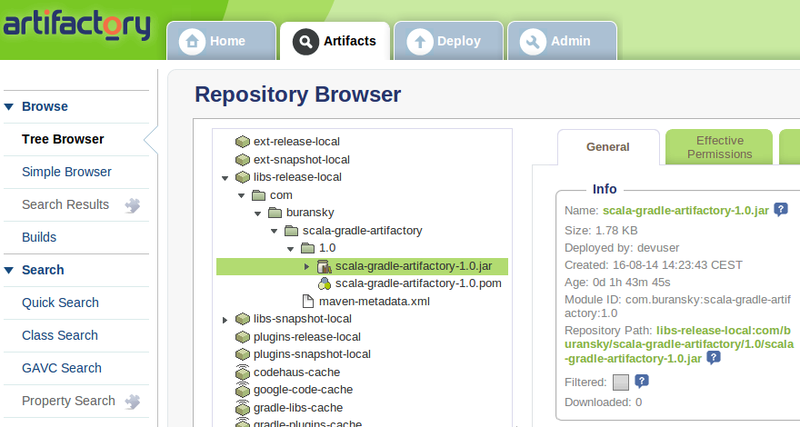 I used Gradle Artifactory plugin to do the publishing. I was lost in endless loop of including various versions of various plugins and executing all sorts of tasks. Yes, I’ve read documentation before. It’s just wrong. Perhaps it got better in the meantime. Executing following has uploaded build info only. No artifact (JAR) has been published. I assume that you already have Gradle and Artifactory installed. I had a Scala project, but that doesn’t matter. Java should be just fine. I ran Artifactory locally on port 8081. I have also created a new user named devuser who has permissions to deploy artifacts.